Presidential candidate Bernie Sanders spoke up about the issue on Monday. His campaign posted to Facebook a video of an October 2011 speech in the U.S. Senate, in which Sanders condemned the Panama Free Trade Agreement that was being considered at the time. Then-Secretary of State Hillary Clinton and President Obama both supported the Bush administration-negotiated agreement, which ultimately made tax evasion an even larger problem. Progressive NGOs and watchdogs warned that this would happen at the time, but Clinton and Obama ignored them and strongly pushed for the deal. Sanders, on the other hand, was one of the few voices to challenge the neoliberal trade deal. “So I think no one is going to legitimately stand up here and say that trading with such a small country is going to significantly increase American jobs,” he explained. Why, then, was the U.S. considering a free trade agreement with the country? He asked. 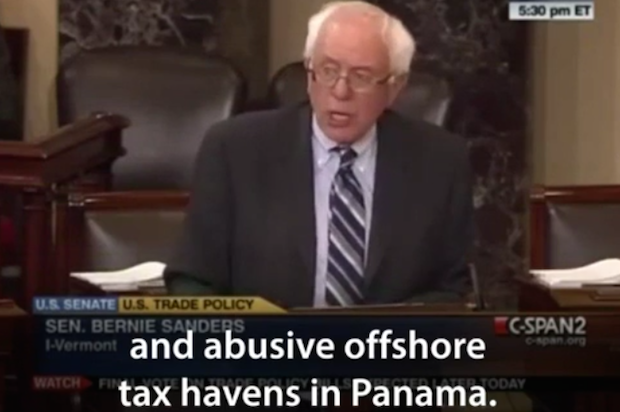 …The free trade agreement Clinton and Obama supported “would effectively bar the United States from cracking down on illegal and abusive offshore tax havens in Panama,” the Vermont senator pointed out. “In fact, combating tax haven abuse in Panama would be a violation of this free trade agreement, exposing the U.S. to fines from international authorities,” he stressed. Sanders also emphasized that the U.S. was losing up to $100 billion in taxes every year “as corporations stash their money in” tax havens like Panama, the Cayman Islands and Bermuda. “At a time when we have a $14 trillion plus national debt, and at a time when we are frantically figuring out ways to try to lower our deficit, some of us believe that it is a good idea to do away with all of these tax havens by which the wealthy and large corporations stash their money abroad and avoid paying U.S. taxes,” Sanders said. The revelations have already led to the resignation of Iceland’s Prime Minister. At least 200 Americans were also named in the papers according to McClatchy.